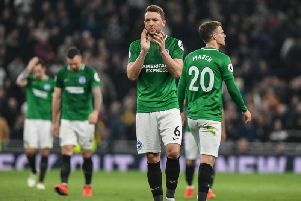 Brighton & Hove Albion manager Chris Hughton believes midfielder Dale Stephens is an undervalued member of the Seagulls squad. After missing the last two games, the 29-year-old could return from a hip injury when Albion entertain Burnley this afternoon. Stephens was the subject of several bids from the Clarets in 2016, before signing a new long-term deal with Brighton in 2017. He has made 55 Premier League appearances in the last two seasons but his work-rate and contribution can often go under the radar. Asked if he feels Stephens is an undervalued member of Albion's squad, Hughton said: "Yes, I think he is. You have only got to look at the amount of games that he has played in recent seasons. "We've changed the shape a little bit and he's still been a consistent member of a midfield two or three. "But I think it comes with the territory. There are players in certain positions that can be up and down that are generally going to get the headlines and I think there are always going to be players that are very much appreciated. "I think in the game, when you speak to other managers, they all appreciate what the likes of a Dale Stephens does for the team but maybe he is not a player as with other players that are generally going to get the headlines. "The most important think is his standing in the game, but more importantly his standing here."